Phoenix, Tucson, Recall Elections: Predictions Anyone? PHOENIX – Arizona Congressmen Jeff Flake and Paul Gosar have endorsed Wes Gullett for Mayor of Phoenix, adding to a broad-based coalition that now includes all Republican members of Arizona’s congressional delegation. PHOENIX – It’s time for Greg Stanton to explain the increasingly troubling pattern of lies and distortions radiating from his campaign and supporters. PHOENIX – Escalating public pension costs, no police chief, taxes on the food we buy. Phoenix needs new leadership, and today’s morning newspaper is just another reminder of why we need a Mayor who will take on the public employee unions and challenge the status quo. It’s the labor unions who are stalling progress at City Hall. And with their organizations pouring thousands of dollars into electing Greg Stanton, only Wes Gullett has the ability to stand up for Phoenix taxpayers and reform city government. “We need to take action. We need a sense of urgency,” Gullett said. Last night, the City Council rejected a move to repeal the food tax. As Mayor, Wes Gullett will provide the critical fifth vote to repeal this tax. Greg Stanton is stalling action and finding excuses to keep the tax, even as Mayor Phil Gordon – a Stanton-backer – admitted “I don’t deny that there’s money that can be found in our budget.” Just more evidence of Stanton’s misaligned priorities. Today’s Republic reports that for the second straight year in a row, Phoenix residents will pay more than $100 million to maintain the city’s ailing pension system. Costs will rise $3.6 million next fiscal year, bringing the cost to $110 million. Only Wes Gullett has put forward a comprehensive plan to take-on the public employee unions and reform this system for the long-term, transitioning city employees to a 401K. His plan was cited in endorsements from both the Arizona Republic and the Ahwatukee Foothills News. Greg Stanton has failed to put forward a plan that deals with the fundamental problems with our pension system, preferring to kick the can down the road. The former police chief of Phoenix resigned months ago, yet the search for a replacement has barely begun. Phoenix has had an “acting police chief” since early March. Gullett called for a national search to begin at that time. 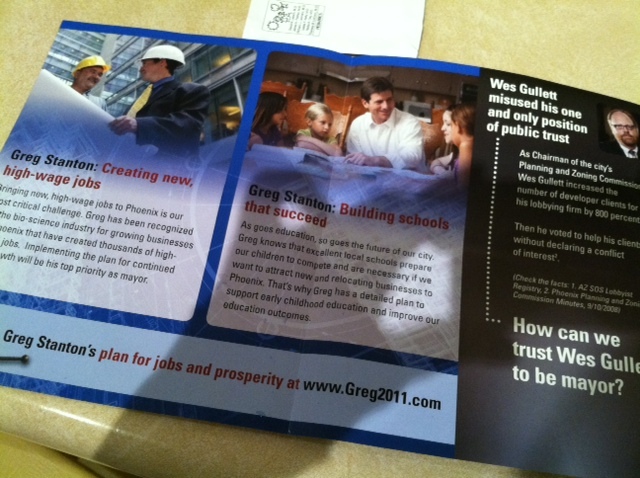 While Stanton won’t commit on this issue, he has outlined more than 40 ways to grow government on his own Web site. Greg Stanton and his allies have proven they will say or do anything to protect the status quo. Even the Arizona Republic has said the ads they are running are flat out lies. Don’t let them get away with it. 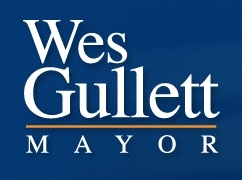 Vote for Wes Gullett for Mayor and let’s repeal the food tax and get Phoenix working again.